Thanks to everyone that came to Bar Kuka last night! It was great playing for you, and we are very much looking forward to be playing in Turku again with the whole band next weekend on Råcktåberfest. 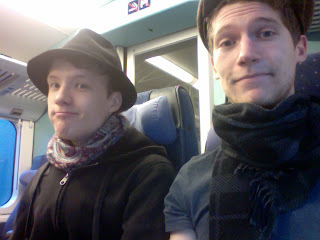 After little sleep, and a long and rainy walk to Turku railway station, me and mr. piano man are now on our way to our hometown Vaasa to meet up with the rest of Timshel, and play a concert at Leipätehdas. I can also reveal that Mr. Piano man´s name is Daniel, and he is an old friend whom I´ve been playing with for about eight years. He will probably be playing with me on acoustic gigs and when we feel his tasteful playing and beautiful harmonies are needed in Timshel. Next week I´ll tell you about our additional bass player as well!